This week’s Séance Sunday will be on a paper by D. E. Broadbent. The paper begins with the proposition that people hate model building. 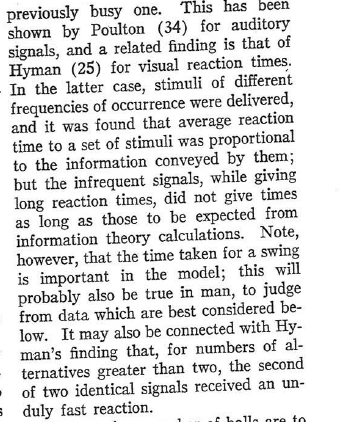 The paper’s purpose is to describe a very basic model of the human perceptual system. 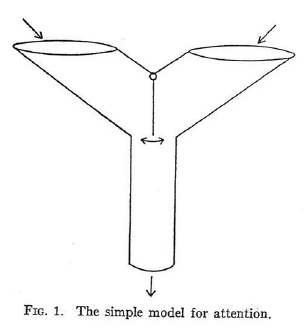 The above figure is the simple model for attention. Needed are a Y-shaped tubes and some small balls. Each ball is numbered individually. The Y-shaped tube has a narrow mouth that takes only one ball at a time. At the junction of the stem and the branches is a flap that typically hangs downward, though it can also be pivoted to close off one branch or the other. The pivoting is done by a handle on the outside of the tube. 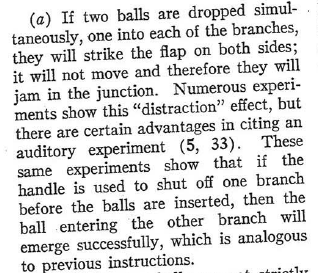 When no human turns the pivot, the ball is free to move into a branch, knocking the flap freely. 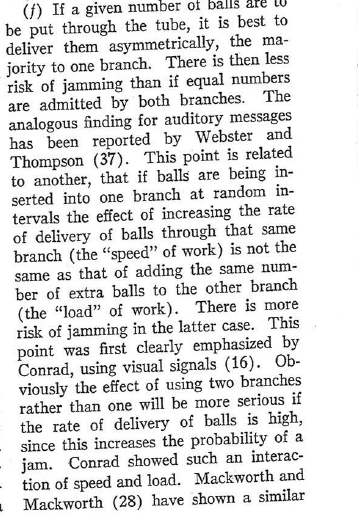 In other words, having several senses being paid attention to at once will cause distraction, and nothing will be properly processed by the brain. However, choosing to focus on one sensory modality at a time means that attention can be focused and information, therefore processed. 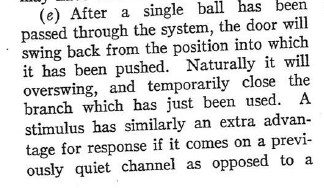 In other words, the first sensory modality to be incoming will take precedence in being processed over the next sensory modality coming right after it. In other words, we are more attuned to certain aspects of a sensory modality than other aspects. For example, we may be able to see this or that color better than another, or hear this or that tone better than another. We are evolutionarily wired to be amore attentive to certain stimuli. For example, mothers’ brains are wired to be attentive to a baby’s cries, whether that baby is hers or not. Hearing any baby cry, a mother’s brain will perk up and pay attention, even if all her babies have grown up. A stimuli that is more forceful will take precedence in our attention. For example, we pay more attention to a bright flashing light than to a nearby low dull tone. Or we may pay more attention to that loud roaring saber tooth tiger than to the pretty butterfly hovering near a flower just to our side. In other words, our senses can become acclimated. Think of a perfume–you smell it at first once you spray it on, but shortly thereafter, you no longer smell if on yourself. Your olfactory system has become acclimated. 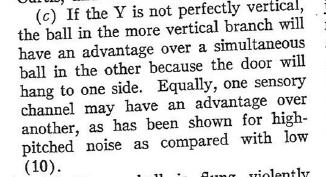 In other words, it is not so much the speed at which a signal is oncoming, but more, how many signals are incoming in a given time interval, that affects processing of stimuli. This article will continue in a part 2 with the remaining scenarios the Broadbent paper describes. 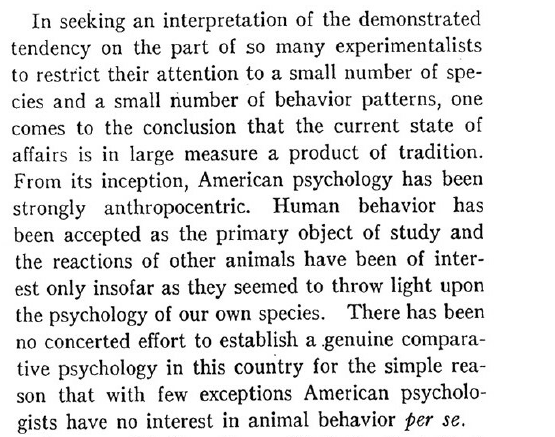 All this sets up the rest of the paper, where Beach indicates that thirty years prior, Comparative Psychologists went hunting for Animal Behavior. The albino rat was found and Comparative Psychologists disappeared. Beach then proposes that his paper traces the history of Comparative Psychology in the US, as well as explain the attitudes of psychologists towards comparative psychologists. 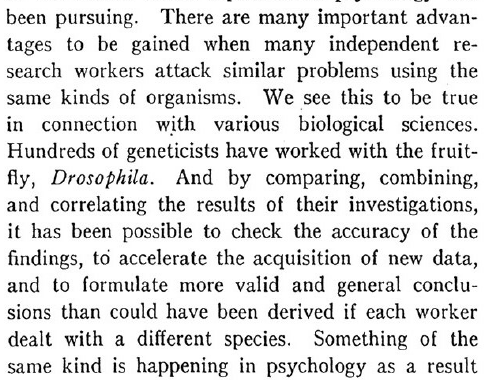 He makes the rather valid point that only a small subset of extant species are studied in the lab; in particular, mammals. Therefore, comparative studies can only be deemed comparative in a very restricted sense. Research went from using mostly amphibious animals, to using mammals. 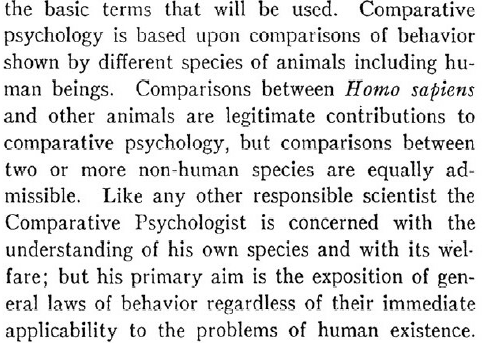 Now, today, both groups of animals are used; though rats and mice are big in neuroscience and psychology. As Beach states, there is excessive concentration on just a few animals. 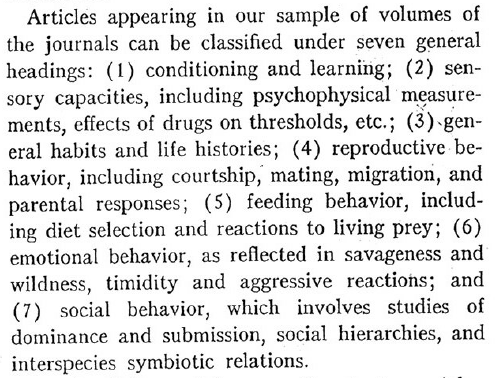 Beach argues that we have mainly been narrow in our selection of animals to study. Now, this makes sense. However, the animals chosen are chosen because their physiology is similar to humans, enough so that any results coming from animal experimentation can be applied to human studies. Also, rats are a favorite because they are easy to rear, are generally hardy unless some strain makes them immuno-susceptible, and they can generally exist well in a laboratory environment. I do understand what Beach is saying, however, and feel that he does indeed have a point. What do you think? Now he does admit that there are advantages and disadvantages to using a small concentration of animals. So what do you think; is Beach right?